For those who think that jazz and Indian classical music have very little in common, there is Ragini Trio to prove them wrong. Jazz and Indian music actually have quite a bit of connective tissue, for the simple reason that they are both based on the same concept, and that is... improvisation. Bad boy Lander Gyselinck and world traveller Nathan Daems infuse voluptuous melodies with snappy jazz beats. Marco Bardoscia, bassist with Pedro Frescu and Enrico Rava, turned out to be the best sparring partner they could possibly have come across. Nathan Daems' musical vision is too vast for Belgium. He is the leader of Black Flower (Ethio-jazz), Nathan Daems Quintet and Bazaar d'Orient (Balkan), but is also sideman with the Antwerp Gipsy Ska Orkestra & Mafiasko Taxi (eclectic Balkan), as well as Va Fan Fahre (Egyptian/Ethio brass band). He is absolutely passionate about Balkan Gypsy music. Lander Gyselinck is bowling over the Belgian jazz scene. 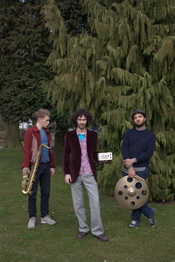 He divides his time and energies between various bands like LABtrio, STUFF and Kris Defoort trio. He studied in New York for a year, during which time he shared the stage with John Zorn. He won the Toots Thielemans Jazz Award in 2010 and was the winner of the Sabam Youth and Music award in 2012. He was also the winner of the Berklee College of Music Award in 2002 and the Jimmy Woode Award as best double bass player (Ronciglione Festival).